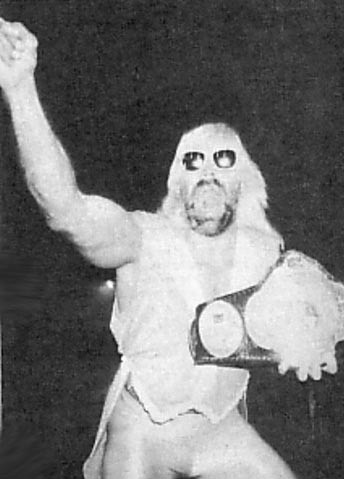 1975: Rip Rogers & Gary Royal were the “Convertible Blondes” in Angelo Poffo’s ICW and the later added Pez Whatley..
1978: Rip Rogers worked for Nick Gulas in Tennesseee using the name “The Disco Kid”..
1984: Rip Rogers formed a tag team with Ted Oates known as the “Hollywood Blondes” for Jim Crockett Promotions..
Rip Rogers worked for Global Wrestling Federation in a group called the Cartel — along with Cactus Jack & Scott Anthony..
1988-90: Rip Rogers worked with a successful homosexual gimmick in Giant Baba’s All Japan Pro Wrestling..
1997: Rip Rogers formed a tag team with Jason Lee known as the “Suicide Blondes” in Ohio Valley Wrestling in Kentucky..
Rip Rogers was named the head trainer at the Ohio Valley Wrestling training facility – developmental league for the WWE..
September 15, 1999 – NWA OVW: NWA OVW Southern tag team champions Jason Lee & Rip Rogers defeated Rico Costantino & Scotty Sabre to retain. September 17, 1999 – NWA OVW: Jason Lee & Rip Rogers defeated Kidd Kwik & Randy Royal. September 21, 1999 – NWA OVW: NWA OVW Southern tag team champions Jason Lee & Rip Rogers defeated American Eagle & Low Rider to retain. September 26, 1999 – NWA OVW: NWA OVW Southern tag team champions Jason Lee & Rip Rogers defeated Damaja & Trailer Park Trash to retain. September 28, 1999 – NWA OVW: Nick Dinsmore & Rico Costantino defeated Jason Lee & Rip Rogers by disqualification. October 6, 1999 – NWA OVW: NWA OVW Southern tag team champions Jason Lee & Rip Rogers defeated Andy Anderson & Barry Houston to retain. October 8, 1999 – NWA OVW TV: Jason Lee & Rip Rogers defeated Jebediah Blackhawk & Trailer Park Trash. October 20, 1999 – NWA OVW: NWA OVW Southern tag team champions Jason Lee & Rip Rogers defeated Scotty Sabre & The Eagle to retain. October 27, 1999 – NWA OVW: NWA OVW Southern tag team champions Jason Lee & Rip Rogers defeated American Eagle & BJ Payne to retain. November 3, 1999 – NWA OVW: NWA OVW Southern tag team champions Jason Lee & Rip Rogers defeated BJ Payne & Chris Alexander to retain. November 10, 1999 – NWA OVW: NWA OVW Southern tag team champions Jason Lee & Rip Rogers defeated Matt & Jeff Hardy in a ladder match to retain. November 14, 1999 – NWA OVW: NWA OVW heavyweight champion Rico Constantino defeated Rip Rogers to retain the title. November 16, 1999 – NWA OVW: Damaja defeated Rip Rogers. November 26, 1999 – NWA OVW: NWA OVW Southern tag team champions Jason Lee & Rip Rogers defeated Guido Andretti & Vito Andretti to retain. November 30, 1999 – NWA OVW: NWA OVW Southern tag team champions Jason Lee & Rip Rogers defeated Jebediah Blackhawk & Trailer Park Trash to retain the titles. December 2, 1999 – NWA OVW TV: American Eagle & Russ McCullough defeated Jason Lee & Rip Rogers by count-out in a dark match. December 8, 1999 – NWA OVW: NWA OVW Southern tag team champions Jason Lee & Rip Rogers defeated Mosh & Thrasher to retain the titles. December 10, 1999 – NWA OVW TV: Damaja & Rico Costantino defeated Jason Lee & Rip Rogers by disqualification. December 16, 1999 – NWA OVW TV: Jebediah Blackhawk & Trailer Park Trash defeated Jason Lee & Rip Rogers to win the southern tag team titles. December 23, 1999 – NWA OVW TV: Damaja & Rob Conway vs. Jason Lee & Rip Rogers ended in a double disqualification. December 26, 1999 – NWA OVW: NWA OVW Southern tag team champions Jebediah & Trailer Park Trash defeated Rip Rogers & Jason Lee to retain. January 4, 2000 – NWA OVW: NWA OVW Southern tag team champions Jebediah & Trailer Park Trash vs. Rip Rogers & Jason Lee ended in a double count-out to retain. January 6, 2000 – NWA OVW TV: Jason Lee & Rip Rogers defeated BJ Payne & Scotty Sabre. January 11, 2000 – NWA OVW: NWA OVW Southern tag team champions Jebediah & Trailer Park Trash defeated Rip Rogers & Jason Lee to retain. January 18, 2000 – NWA OVW: Jedediah defeated Rip Rogers by disqualification in a falls count anywhere match. January 19, 2000 – NWA OVW: Derrick King, Jason Lee & Rip Rogers defeated Jebediah, Russ McCullough & Trailer Park Trash. January 25, 2000 – NWA OVW: Russ McCullough defeated Jason Lee & Rip Rogers in a handicap match. February 24, 2000 – NWA OVW TV: Jason Lee & Rip Rogers defeated Damaja & Rico Costantino. February 29, 2000 – NWA OVW: Derrick King, Jason Lee & Rip Rogers defeated BJ Payne, Jebediah Blackhawk & Scotty Sabre. March 7, 2000 – NWA OVW: Jason Lee & Rip Rogers defeated Jebediah & Randy Royal. March 9, 2000 – NWA OVW TV: BJ Payne & Scotty Sabre defeated Jason Lee & Rip Rogers. March 17, 2000 – NWA OVW TV: Derrick King, Jason Lee & Rip Rogers defeated Damaja, Rico Costantino & Russ McCullough. March 23, 2000 – NWA OVW TV: NWA OVW Southern tag team champions Scotty Sabre & BJ Payne defeated Jason Lee & Rip Rogers by disqualification to retain the titles. March 23, 2000 – NWA OVW TV: Jason Lee & Rip Rogers defeated Guido Andretti & Vito Andretti. April 18, 2000 – NWA OVW: BJ Payne, Rico Costantino & Scotty Sabre defeated Derrick King, Jason Lee & Rip Rogers. May 4, 2000 – NWA OVW TV: Derrick King, Jason Lee & Rip Rogers defeated Ali, BJ Payne & Scotty Sabre. May 9, 2000 – NWA OVW: Randy Royal defeated Rip Rogers. May 20, 2000 – NWA OVW: NWA OVW Southern tag team champions Scotty Sabre & BJ Payne defeated Jason Lee & Rip Rogers to retain the titles. January 31, 2001 – NWA OVW: Derrick King, Jason Lee & Rip Rogers defeated Buddy Landel, Chris Michaels & Sean Casey. March 2004: Rip Rogers was given his release from the WWE as head trainer for WWE developmental talent..
October 29, 2005 – OVW: Deuce Shade, Jason Riggs & Rip Rogers defeated Aaron LaMotta, J-Man & Oza Zuka. July 2, 2010 – PSW: PSW heavyweight champion Damon TAZ defeated Rip Rogers to retain the title. August 6, 2010 – PSW: Drew Scott, Jed Johnson & Tyler Gage defeated Frankie Valentine, Rip Rogers & Thirteen.